This section will contain all kind of info and significant updates about the RAF's workhorse platform, the Typhoon. This collection of data, inclusive of a few comparisons with other airplanes in service in the world, is also meant to make some justice to the Typhoon, a platform that, in my opinion, too many have too often maligned without really knowing of what they are talking about. The Eurofighter Typhoon is a twin-engine, canard-delta wing, multirole combat aircraft, designed and built by a consortium of three companies: Alenia Aeronautica, BAE Systems, and EADS; working through a holding company, Eurofighter GmbH, which was formed in 1986. The project is managed by the NATO Eurofighter and Tornado Management Agency, which acts as the prime customer. The Eurofighter Typhoon is the top creation of European aeronautic technology, and it has been and continues to be a massive stimulus for the high-technology industry achievements in Europe. Export orders and future upgrades will have a crucial importance in ensuring the survival of proper aeronautic technology in Europe. It is estimated that Eurofighter directly employs over 100.000 highly skilled engineers and works across Europe, 40.000 of which in the UK, 25.000 in Spain and roughly 20.000 each in Germany and Italy. Professor Keith Hartley, from the Centre for Defence Economics, University of York, in a study over the effect of Typhoon onto the economy uses different criteria and puts the figure at 66.000, but he also reports that many of the Typhoon’s labour skills are highly transferable (e.g. to motor car and electronics industries; and to work on Airbus A380, A350 and others). An impressive set of examples of the technology benefits from Typhoon were also identified. These include carbon fibre technology; super plastic forming and fusion bonding; modular avionics; the flight control system; and aero-engine technology. Technology spin-offs were also identified from the Typhoon Programme to civil aircraft, to motor car industries (including Formula 1 racing cars in Italy and the UK) and to supply chains. These technology externalities were valued at Euros 7.2 billion (minimum). In February 2008, the import-savings contribution of Typhoon was substantial and greater than its export earnings. The estimated value of the balance of payments contribution of Typhoon is Euros 43.5 - 64 billion. Range data is to be taken with obvious prudence, also because it is not specified the exact weapons and external fuel load-out. Figures are indicative. The Typhoon is equipped with a single MauserWerke GmbH developed BK-27 cannon mounted internally in the fuselage forward of the starboard wing. The Mauser cannon is becoming a standard weapon for European airforces, it equips among other aircraft the Tornado, Alpha-jet blister pods and SAAB/BAe Gripen. It utilises 27mm high explosive shells with a maximum firing rate of some 1700 rounds a minute, each aircraft will likely carry approximately 150 rounds. Several different types of shell are available. All ammunition types have the same internal and external ballistic behavior, which means the sights do not have to be adjusted for each type. They decided that the best option was to create something which would sit in the middle, combining the best of both worlds, with an highly effective round and an high firing rate. The BK-27 is proven and has always performed well, so much that it was initially planned that the Joint Strike Fighter F35 would employ a variant of it! The system itself is relatively compact and extremely robust with a proven in service Mean Rounds Between Failure (MRBF) of over 23,000, the combined MRBF for the unit plus ammunition is over 14,000. In addition the manufacturer also claims the gun, with a projectile weight of 260g and a fuse function to 85° impact angle, outperforms all other lightweight fighter cannon systems. The particular installation being used for Eurofighter features a new linkless closed ammunition feed system with case recovery. This is a first with a revolver gun and provides a 60% reduction in the volume of installed ammunition. As with the external weapon loads, targeting of the cannon is done through the HUD. When the cannon is selected a firing predictor is projected onto the Head Up display. This depicts a moving line, or snake which predicts where the next few rounds of cannon fire will go. The system also incorporates auto-fire, whereby a burst of fire can be automatically engaged when the target passes through the sight. In May 2000 the British MoD announced that Tranche-2 and 3 Eurofighter's in RAF service would have not been fitted with any cannon whatsoever, while Tranche-1 cannons would not be utilized. The recommendation for this was made by the Equipment Capability Organisation (ECO) which was tasked with finding the most appropriate mix of weaponry for combat systems. The official Government line is that the capability offered by ASRAAM equipped Eurofighter's leads to the cannon becoming operationaly and economically unviable [note that the correct reading of this statement is “we must cut on something because there’s no money. This sounded smart!”]. At the time, the British MoD had already spent £90M on the BK-27, while annual savings from not using it were put at a mere £2.5M (the costs of removing it were calculated at £32M). This, coupled with the problems in aircraft balance if the gun was removed (or swapped for a concrete ballast, as it was also proposed), which would have required expensive software redesign, led to the cancellation of this absurd cost-cutting measure plan. Typhoons all are fitted with their gun, and can use it and do use it, also thanks to the reports on the limitations of Harrier Gr9 without guns in providing fire support to troops in Afghanistan. Which leads me to put forwards a question: the F35C won’t have an installed gun, but will come with a four-barrel 25 mm gun pod to be mounted centerline under the fuselage. How high are the chances that some idiot comes up with the smart idea, once more, of not acquiring the gun pods…? The F22 and F35 have accepted a lot of compromises and cost increases in order to obtain such high levels of Low Observability to be able to survive against enemy action and defences. The Typhoon has chosen a different and cheaper approach, which also promises to be more easily upgraded: the fighter it is in fact fitted with the most effective and wide-ranging modular Electronics Self Defence system in service on any airplane worldwide. This is particularly true for the RAF Typhoons, which (sorry and messy gun saga forgotten) are the best and most completely equipped Typhoons in the world. They employ the full DASS (Defensive Aids Sub-System), with a full kit of Laser Warning Sensors and also a couple of Towed Radar Decoys, which other nations have not acquired in an effort to save money. The DASS, now officially named Praetorian, is the modular system tasked with protecting the Typhoon from enemy engagements. The DASS is equipped with Radar Warning Receivers (RWRs) designed to detect such emissions. The particular units used are Super Heterodyne (SuperHet) based wide-band receivers and are located in the port side pod (both front and rear) and within the aircraft's fuselage giving full 360° coverage in azimuth (elevation coverage is currently unknown). These units are combined with on-board processing systems enabling not only a bearing to be determined but also the likely type of radar (and thus the platform it is deployed on). This is achieved using a stored database of radar signatures forming part of the ESM, Electronic Support Measures suite. Through the use of high speed digital signal processing the ESM will attempt to map the detected emission to its database. One of the weaknesses of current (and more so older) RWR systems is a difficulty in countering Low Probability of Intercept (LPI) enabled emissions. These use various techniques to try and hide the emitted signal. The capabilities of the DASS RWRs to detect and classify such emissions are obviously classified, but it is known that Marconi (now BAE Systems) have been working hard in this area for some time. It is not uncommon to find aircraft fitted with laser range finding equipment to accurately determine distances. There are also laser guided weapons available which ride the beam to their target. 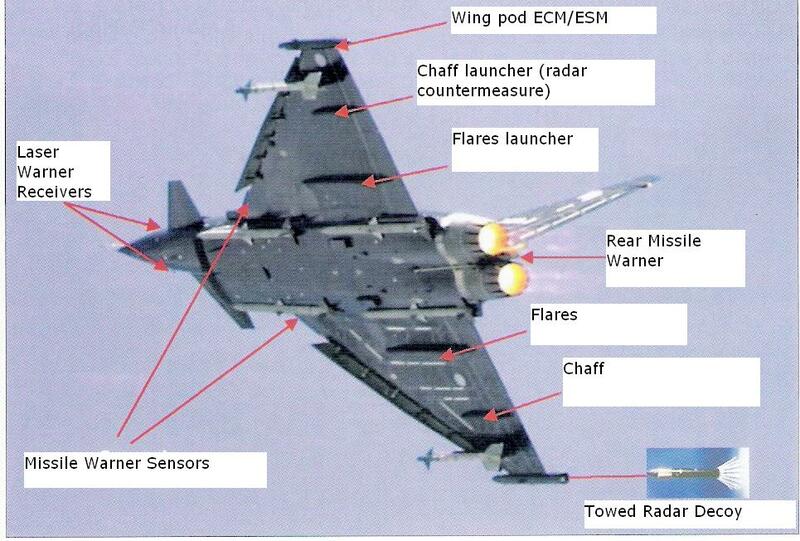 To counter such threats the RAF Typhoon's will be equipped with a Laser Warning Receiver, LWR with two sensors. Mounted below the nose the units will be capable of detecting any incoming laser radiation and determine its bearing. Although the goal of any fighter pilot is to remove an enemy before they have fired there will of course be occasions when this is not the case. To enable tracking of such missile launches the DASS incorporates three Missile Approach Warners (MAW), one each in the port and starboard wing roots (near the cockpit) and one in the rear fuselage (near the tail). Since the units are active they are able to detect not only radar guided ordnance but also passive weapons such as infra red guided short range missiles. To increase the effectiveness of the system the MAW is also directly linked to the flare launchers allowing an instantaneous response to a local launch. Although almost as old as radar itself [remember the “window” secret-weapon of the Bomber Command in the IIWW!] chaff is still one of the fundamental defences available to a fighter aircraft. The Eurofighter's DASS includes internally carried Chaff dispensers within the outer (short range missile) wing pylons thus freeing the pylons for weapon carriage. The system can be controlled automatically by the DAC and AIS or manually by the pilot. In addition the on-board ECM generators can be used to illuminate the chaff cloud with a radio beam becoming what is termed Jaff. This increases the performance of the otherwise passive chaff substantially but even here the usefulness of chaff is being eroded by modern active radar missiles and digital signal processing techniques. The development of Infra Red guided weaponry also led to the deployment of a simple yet effective counter in the form of pyrotechnic Flares. 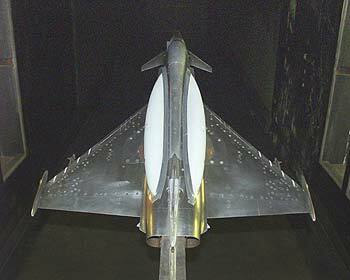 As with the chaff, the DASS specification includes flare launchers carried internally within the inboard wing fairings. The system can be operated in three ways; manually by the pilot, automatically by the DAC and, in response to an immediate threat, by the Missile Approach Warner's. The release pattern is automatically controlled to minimise the risk of the incoming missile recognising the flares for what they are. Both the chaff and flare dispensers will be supplied by SAAB Technologies of Sweden in the form of their BOL dispenser. This is basically a cylinder containing chaff or flare packages. These individual packets are moved along the container electro-mechanically before being dumped out the rear and into the aircrafts slipstream where they disperse. The system is fully self-contained and has a proven record being in use with several European air forces as well as the U.S. Navy. Additionally the BOL system is not limited to simple chaff/flare packets but can carry a range of different expendable decoy systems. Although chaff is a simple and often effective counter measure against enemy radar there is a further, active, method. This comes in the form of Electronic Counter Measures or ECM which essentially emit radio frequency energy directed at the threat. The aim of such a system is to either fool the opposing radar into thinking the aircraft is somewhere else or overpowering it completely thus rendering it useless. The basic DASS specification includes a radio frequency jammer located in the port side pod allied with the DAC and ESM systems, including a techniques generator. When combined with both the DASS and other sensors the on-board techniques generator can deploy an appropriate type of jamming for the current threat. Although the exact specifications of the system are classified the system should be capable of decoying and jamming all types of modern radar; Continuous Wave (CW), Pulse and Pulse-Doppler. The form of ECM generated can be altered on the fly by the DAC as and when required. The Cross Eye (X-Eye) system developed by Italy's Elettronica uses two widely spaced radio frequency emitters (one in each wing tip pod) to generate two identical repeater type jamming beams. These can be directed at an incoming missile or aircraft and under tight control they can cause a significant aiming error within the opposing systems radar. This should result in the opposing missile or aircraft believing the Eurofighter is in an entirely different location. One of the most recent additions to the arsenal of active radar counter measures is the Towed Radar Decoy or TRD. These systems deploy a unit externally from the aircraft on some kind of cable. As part of the basic Royal Air Force specification the DASS incorporates either one or two TRDs (the number is dependent on other systems present in the starboard pod, i.e. Cross-Eye) as standard. The units will be carried in the Starboard side pod and will be capable of being recovered or jettisoned as the situation may dictate. The RAF's DASS TRD is to be a development of BAE Systems Ariel system which has already been successfully deployed on RAF Tornado's and Nimrod's. The major physical difference is a decrease in the overall size enabling carriage within the Typhoon's pods. The unit is deployed from the pod on a 100m Kevlar cable containing a Fibre Optic (FO) link and a separate power distribution line. Through the FO cable the DAC's techniques generator can send commands to the decoy based radio frequency emitter. The TRD can produce a range of jamming techniques to fool or lure the missile away from the aircraft. The modular nature of the DASS allows buyers to select which systems they want, fit them as they please, and also allows for a great ease of replacement and upgrade. Another advantage on design-driven Low Observability that, once countered, will have nearly no chance of being upgraded significantly, other than with the use of new coating paints. Redesign the F22’s fuselage will obviously be impossible, after all. Traditionally each sensor in an aircraft has been treated as a discrete source of information. However this can result in conflicting data and hence an increased pilot workload. Additionally it limits the ability to effectively automate systems. To overcome this the Typhoon employs what is now known as sensor fusion techniques (in a similar fashion to the U.S. F-22 Raptor). Considering that the Typhoon's avionics systems are still based on a typical distributed, or federated system (i.e. individual components linked via a standard databus) rather than a centralised architecture (which the F-22 has gone some way towards implementing) this seems like quite an achievement. In the Eurofighter this fusion of all data sources is achieved through the Attack and Identification System, or AIS. The AIS combines all data from the major on-board sensors along with any information obtained from off-board platforms such as AWACS, ASTOR, JSTARS or even other Eurofighter's via the Multi-function Information Distribution System, or MIDS link. Additionally the AIS integrates all the other major offensive and defensive systems such as the; DASS, Navigation, ACS (Aircraft Combat System, basically commands the gun and the pylons) and Communications. The physical design of the AIS comprises of essentially two separate units; the Avionic Computer (AC) and Navigation Computer (NC). These are linked via the STANAG-3910 databus to the other major systems such as the ACS, ECR-90/CAPTOR, PIRATE IRST, etc. By having such a single source of information pilot workload should be reduced by removing the possibility of conflicting data and the need for cross-checking, improving situational awareness and increasing systems automation. In practice the AIS should allow the Eurofighter to identify targets at distances in excess of 150 nm and acquire and auto-prioritise them at over 100nm. In addition the AIS offers the ability to automatically control emissions from the aircraft, so called EMCON (from EMissions CONtrol). This should aid in limiting the detectability of the Typhoon by opposing aircraft further reducing pilot workload. CAPTOR is a third generation coherent X-band (8 to 12 GHz) multi-mode Pulse Doppler radar system developed from GEC's Harrier FA.2 Blue Vixen system. It offers twice the power output of the APG-65 combined with long range search and track and continuous illumination (for semi active missiles). The real time control software, written in ADA to MIL-STD 2167A comprises some 500,000 lines of code. The unit itself is highly modular comprising some 61 Shop Replaceable Items (or SRIs) and around 6 Line Replaceable Units (or LRUs) weighing in at 193kg. This should enable quick maintenance turn-around as well as simple upgrade paths. The operating modes available to CAPTOR fall into three basic classifications; long range air to air, close range visual and air to surface. For long (beyond visual) range combat CAPTOR will automatically select an appropriate mode depending on the current situation. For example, long range look-up detection will typically find the system selecting a Low Pulse Repetition Frequency (LPRF). However for look-down situations a high pulse repetition (HPRF) will generally be used. For situations where both look-up and look-down need to be covered simultaneously or where range and velocity data is required a medium rate would be used. In addition CAPTOR will automatically initiate Track While Scan (TWS) for a list of targets (the exact number of possible tracked targets remains classified). The system employs Data Adaptive Scanning (DAS) to improve tracking of its selected targets while minimising unnecessary movement of the antenna. For close-in combat situations CAPTOR will automatically adjust its mode for a high precision single target track. A further useful function in this mode is the ability to slave the radar directly to the Helmet Mounted Sight. The resulting data can then be used to queue short ranged air to air weaponry such as ASRAAM. Finally CAPTOR has a range of air to surface modes including; beam mapping, sea and surface search, Ground Moving Target Identification (GMTI) useful for picking out moving surface targets such as armour, spot mapping and surface ranging. The Synthetic Aperture Radar (SAR) mode offered by Tranche-1 Eurofighter's gives a 1m resolution, test flights have occured reducing this to 0.3m (this improvement should be introduced for Tranche-2). As with the air to air and close range modes, air to surface modes can be automatically selected by the system as required. Just like most Typhoon systems VTAS provides the pilot with an easy way of communicating with the radar to manually change modes, alter target selection and the like. In 1997 Marconi indicated CAPTOR had detected fighter sized aircraft at ranges of well over 160km and larger aircraft at double that. More recent information indicates the systems range accuracy is within 10 metres while it can obtain a target angle to within 1 miliradian. The system is capable of tracking 20 air targets simultaneously, automatically identifying and prioritising them. When in the track list the appropriate weapon can be automatically selected (a function in part of the ACS) and using auto-attack the aircraft can be flown under autopilot to a selected air target. All of these capabilities are designed to significantly reduce the workload of the pilot during combat operations. Even though CAPTOR features a mechanically steered array, BAE Systems have indicated that the low inertia non-counterbalanced antenna coupled with four high torque, high precision samarium-cobalt drive motors allows extremely high scanning speeds. As a consequence of this the radar can interleave different operations such as air and ground mapping. This is quite an achievement for a non-phased array system. CAPTOR is designed to be highly resistant to ECM and passive countermeasures. To this end it includes a unique separate (third) data channel exclusively for screening ECM sources. In extremely bad ECM environments the AIS should limit the effects of reduced CAPTOR information through its other data sources. The CAPTOR is an active system, it operates by transmitting radio waves. Whenever the radar is operational the power it outputs can be detected by an enemy using a Radar Warning Receiver (RWR). Even Low Probability of Intercept (LPI) radar's such as the American APG-77 risk detection. There are really only two ways to solve this problem. One method (which Eurofighter also makes extensive use of) is to utilise data gathered from other platforms such as AWACS, Nimrod, JSTARS, ASTOR or even other fighters. However this requires such platforms to be available and for the datalinks from those platforms to be jam resistant. An alternative method is to use an on-board passive system for detection. The PIRATE, or Passive Infra Red Airborne Tracking Equipment is a 2nd generation Imaging Infra Red (IIR) system and performs this duty of passive detection. PIRATE is constructed by the EuroFirst consortium led by Pilkington-Thorn Optronics (now Thales Optronics). PIRATE incorporates both a Forward Looking Infra Red (or FLIR) and Infra Red Search and Track (or IRST) capability. The system itself utilises a highly sensitive Infra Red sensor mounted to the port side of the canopy. This equipment scans across wavelengths from 3 to 11 µm in two bands. 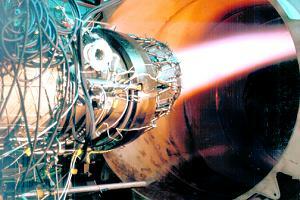 This allows the detection of both the hot exhaust plumes of jet engines as well as surface heating caused by friction. By supercooling the sensor even small variations in temperature can be detected at long range. Although no definitive ranges have been released an upper limit of 90nm has been hinted at, a more typical figure would be 30 to 50nm. The use of processing techniques further enhances the output, giving a near high resolution image of targets. The actual output from the system can be directed to any of the Multi-function Head Down Displays mounted within the cockpit. Additionally the image can be overlaid on both the Helmet Mounted Sight and Head Up Display. The IIR sensor is stabilised within its mount so that it can maintain a target within its field of view. Up to 200 targets can be simultaneously tracked by the system using one of several different modes; Multiple Target Track (MTT), Single Target Track (STT), Single Target Track Ident (STTI), Sector Acquisition and Slaved Acquisition. In MTT mode the system will scan a designated volume space looking for potential targets. In STT mode PIRATE will provide high precision tracking of a single designated target. An addition to this mode, STT Ident allows for visual identification of the target, the resolution being superior to that provided by CAPTOR. Both Sector and Slave Acquisition demonstrate the level of sensor fusion present in the Typhoon. When in Sector Acquisition mode PIRATE will scan a volume of space under direction of another Typhoon sensor such as CAPTOR. In Slave Acquisition the use of off-board sensors is made with PIRATE being commanded by data obtained from an AWACS for example. When a target is found in either of these modes PIRATE will automatically designate it and switch to STT. Once a target has been tracked and identified PIRATE can be used to cue an appropriately equipped short range missile, i.e. a missile with a high off-boresight tracking capability such as ASRAAM. Additionally the data can be used to augment that of CAPTOR or off-board sensor information via the AIS. This should enable the Typhoon to overcome severe ECM environments and still engage its targets. 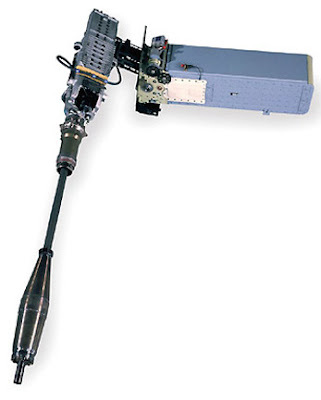 Other notable systems are the Direct Voice Data Input, which allows the pilot to do many things just by saying aloud commands registered in a vocabulary that can be personalized as needed, and the Striker Helmet Mounted Sight recently delivered, which will allow active targeting of missiles, in particular ASRAAM, just by looking at the target. the BAE SYSTEMS ‘Striker’ Integrated Display Helmet provides 24 hour, all weather, all attitude operation over the full combat flight envelope. Capabilities include weapon/sensor slaving with real world overlay of flight parameters, sensor data - e.g. IRST (infra-red search and track), target cueing, weapon status and night vision. These are designed to maximize effectiveness across the whole spectrum of tactical missions. It fits into standard ‘protection and comfort’ RAF requirements to 9G, and has actually two visors, one giving ballistic protection and display function and one protecting against light and laser blinding. It weights 1.9 kg in Day configuration and 2.3 kg in Night configuration, with full oxygen mask and other kit. It also provides NBC protection, and although developed with the Typhoon in mind, the helmet can be used on other fixed and rotary wing platforms. It has been claimed by some that the pilot will be able to then fire the missile with just a voice input, but it actually seems that this is not allowed: Direct firing command has apparently not been inserted in the functions for safety reasons. The Typhoon programme, numbers and tranche system is not the easiest of things to follow, so I think I’ll start by making some clarity over the numbers first of all. It is worth remembering that, back in the 80s when the programme was being started up, Germany and the UK were planning for 250 airplanes each. The UK ultimately signed the so called “Umbrella Contract” with Germany, Italy and Spain, setting out a target of 232 airframes to acquire. The RAF has taken delivery of 53 Tranche 1 airframes, the ones that currently make up most of the inventory, but that are to be retired (almost certainly) around 2015, the famous cut touted recently to the Typhoon fleet. All these planes have been progressively brought to full multimission standard (FRG4 for the RAF), even if only the 11 Squadron has so far been cleared so far as a “swing role” squadron, with the certified and trialed ability to use Litening III laser designation pods and Paveway II bombs. The (-2) represents the two RAF T1 slots that were given to Austria to satisfy the requests of the austrian government, which changed the contract signed by their predecessor for 18 Typhoons to 15. On 2 July 2002, the Austrian government announced the decision to buy the Typhoon as its new air defence aircraft. 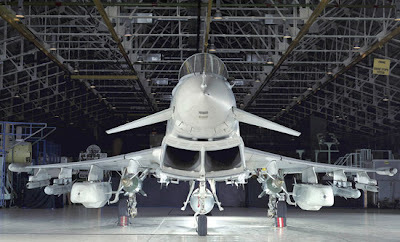 The purchase of 18 Typhoons was agreed on 1 July 2003, and included training, logistics, maintenance, and a simulator. On 26 June 2007, Austrian Minister for Defense Norbert Darabos announced a reduction to 15 aircraft. The first aircraft was delivered on 12 July 2007: the order from Austria was met by giving them production slots once planned for the four designer countries, with the RAF giving away two airframes, Germany 11, Spain and Italy one each. These T1 slots were added to the following Tranche 2 order for each nation, so that the UK order of 89 airframes climbed to 91. However, the RAF in 2007 agreed to give 24 of its Tranche 2 planes to Saudi Arabia, with 48 more planned to be built in Arabia. Now, it seems instead that the Saudis are dropping the home-building plan, instead having their Typhoons all assembled in the UK, but possibly to Tranche 3 standard. A second buy of up to 48 more planes has been touted more than once, and this option has never been officially dismissed. Saudi Arabia is also expected to buy 4 billion pounds of weaponry for the Typhoon, from ASRAAM missiles to Storm Shadow and possibly Brimstone. The effective Tranche 2 for the RAF is thus of 67 planes. Contract for the first part, Tranche 3A, was signed at the end of July 2009 for 112 aircraft split across the four partner nations, including 40 aircraft for the UK, 31 for Germany, 21 for Italy and 20 for Spain. These 40 aircraft were said to have fully covered the UK's obligations in the project by Air Commodore Chris Bushell, due to cost overruns in the project. This last assumption is, essentially, rubbish, however. The Umbrella Contract is vincolated to multinational agreement: the UK can’t decide on its own to pull out unilaterally and cause cost overgrowns for the other partners. The UK will be able to renounce to the Tranche 3B because, almost certainly, all other partners will also do it: Germany, which plans to have its air force flying only Typhoons, is heavily committed and interested in the plane, but due to budgetary pressure of her own, the Luftwaffe is unlikely to have the funds to press ahead with T3B buy. Italy voiced the intention of renouncing to its own T3B slots, and Spain is unlikely to pose problems, also because 14 airframes make arguably little difference for them. However, the interest of everyone is to keep the Typhoon production line running and open for as long as possible: in the UK, over 40.000 jobs depend from the Typhoon, with 20.000 more in Germany and roughly the same number in Italy. Besides, the Umbrella Contract was a commitment made to the Eurofighter consortium as well, and the partner nations will drop their own T3B buys in exchange of political support to the export drive of the consortium, which aims to sell the plane abroad to cover all the planned production run, and possibly more. Retiring the 53 Tranche 1 in 2015 would give the RAF the known total figure of 107 airframes. The 559 airframes so far ordered compare very favorably to any competitor, from the F22 to the Rafale, whose production runs have been far smaller. The Typhoon is a front-runner in many foreign programmes for acquisition of modern fighters, and several deals are reportedly very likely in the coming two years. Oman – 24 Typhoons. The RAF is offering used T1 airframes, or the selling of T3B slots, which reportedly allure the sultanate more. The deal was to be completed already by now (the MOD had imprudently booked 500 millions pounds coming from this deal, confident that by PR11 they would have effectively come! ), but the unrests in and out of Oman have slowed this process down, with the governments in the area delaying part of their (massive) military expenditure to give the shouting crowd some sweeteners. The deal is still expected to be signed late in the year, though, and it appears to be just matter of time. Qatar – 24 to 36 airframes. Expected to be ordered by 2012. The Dassault Rafale seemed to have better chances in this area for some time, but the UK has been pressing very aggressively to pitch Typhoon instead, and it lately appears that the efforts are paying off. The Typhoon is now a likely winner. Indonesia – up to 24. Of this month is the news of the talks between UK and Indonesia. Indonesia informally approached Britain over the potential acquisition of up to 24 jets. The previous Labour government banned defence exports to the country in 1999 amid claims it had used British-made Hawks to bomb East Timor rebels. The sale would be worth around 5 billion pounds ($8.1 billion dollars, 5.8 billion euros) in total, but would be hugely controversial in light of current concern over the source of weapons being used against Arab rebels. BAE Systems has separately offered to upgrade Indonesia's fleet of Hawk jets, it has been said. Defence minister Gerald Howarth will discuss the potential sale when he attends a defence summit in Jakarta later this month, the Times said. "I fully expect that to be the case," Howarth told the paper. "Typhoon is on their agenda. Their interest shows the extent of interest by countries around the world in what is one of the most sophisticated aircraft anywhere." Switzerland – A requirement exists, and Typhoon is in competition with Rafale and Gripen. The Typhoon, being used by nearby Austria and Germany and Italy, has an edge. The Gripen would likely be less expensive, however. The Rafale would be, in my opinion, a bit of a weird choice. I believe Typhoon has a long chance here. Greece – 60 airplanes. In 1999, the Greek government agreed to acquire 60 Typhoons in order to replace its existing second-generation combat aircraft. The purchase was put on hold due to budget constraints, largely driven by other development programs and the need to cover the cost of the 2004 Summer Olympics. In June 2006 the government announced a 22 billion euro multi-year acquisition plan intended to provide the necessary budgetary framework to enable the purchase of a next-generation fighter over the next 10 years. The Typhoon is still their choice, and it may be only a matter of time. India – 126 airplanes. In January 2010, India's ambassador to Italy, Arif Shahid Khan, said that the Eurofighter was "leading the race" to win the MRCA competition. The chances are very good. Japan and South Korea – Unlikely, even though Japan showed interest when offered a substantial role in production and further export. Japan wishes to get a license and buy its new fighter at home, just like it did with their local “clone” of the F16. Production at home is needed to keep the industry alive and kicking, and the Eurofighter consortium has offered full support and participation. However, they also want stealth. They are angry they have been denied the F22, and the Typhoon talks might only be a way to put pressure on the US. The F35 has lately been reported as new leading contender, but Japan wants the new fighter to be TWIN engined, since it will be flying long missions over the ocean. Besides, they are worried about costs and performances, and are taking their time to wait and see what really happens with the F35 development and production. The Typhoon might still have chances to get this that would be a truly historic, first-ever triumph for European military airplanes on the Japanese, US-saturated market. Next to none are the chances of winning in South Korea, where the F35 is likely to be their very first choice. Bulgaria - 12 planes. Bulgaria plans to issue a request for a new fighter jet next year, with a tight delivery schedule: they want the planes in 2014/15 time. This makes a second-hand buy very likely, and the only real alternative to Typhoon is old F16 planes. The RAF, though, has very high chances of selling some of its retired, young (almost-new, in fact) T1s. Slovenia and Croatia – Slovenia currently has no fighter jet left at all, and Italy is tasked with the defence of its air space. Plans exist for a return to fighter jet ops in 2015, however. Croatia needs to replace its Mig 21 fighters, and plans to start the procurement process next year: talks are under way for the acquisition of 12 to 18 Typhoons. Lately, talks have been starting with Slovenia, so to coordinate their effort and buy planes which would equip a single, bi-national squadron tasked with air defence for both countries. Again, the used ex-RAF T1s would be perfect for this requirement: their limited ground attack capability would not be seen as a defect, and the advantageous cost for such young and capable airframes is attractive to pretty much everyone. Romania – It could also get 24 Typhoons. These, though, could be second-hand planes from Italy. No plane in history has been surrounded by more hype than the F22, and people regularly tell us that the F22 beats the Typhoon at any time. Normally, I find this kind of declarations childish, but I was puzzled by the hate shown by several bloggers and commenters on the internet telling that, seen the cost overruns, the RAF would have been “better off buying F22s, at least they would have been more capable”. I thought I’d remember to everyone a few things that I think it is better remember: while it is very true that the Typhoon has experienced delays and cost overruns, it is to be noted that it remains a remarkably competitive fighter even on the economic front. Its cost is not as good as it had been planned originally, but it still beats or is on par of its rivals. Even the NAO admitted it in its report. Cost overruns, again, are inevitable if costs planned to be absorbed over 250 planes end up being spread on 232, then 160 then 107. Planning should be done better, and at the start of a programme of these dimensions. Once a plan has been agreed upon, the basic rule should be: stick to it as much as possible. The Typhoon has not experienced the same cost growth of the F22: for the Typhoon, the cuts in the orders (determined by budget reductions in the partner nations’ defence funds), have caused most of the cost overruns. A different thing entirely from what happened with the F22, that simply continued to get more and more expensive even as IRST, side-radar arrays and other fancies were deleted, forcing the USAF to cut its plans from 750 (!) to 330 to the definitive 187. This for the purely economic side. Now, about performances. Would the RAF really be that “better off” with the F22? When we look past the hype, we see that no, likely it would not be better off at all. In many parameters, the Typhoon matches the F22, such as in Thrust : Weight ratio (> 1.10 for both planes), it has got a lighter wing load (330 kg against 350 kg for square meter), it has the same optimal missile load-out for AA ops (for both it is 6 BVRAAM and 2 SRAAM missiles), both are highly maneuverable. Typhoon beats F22 at acceleration (the Typhoon has a formidable “0 to Mach 1.5” sprint in 150 seconds capability) and supersonic maneuverability, while it is substantially on part at subsonic maneuverability. The F22 beats the Typhoon by having an higher super-cruise speed without afterburners (things would change if the Typhoon was equipped with thrust vectoring nozzle, which would improve, between the others, this parameter as well), but needs 9 tons of fuel to do roughly the same that Typhoon does with 5. The Typhoon has significant advantages in terms of avionics: the F22 does not have an Infra-Red Tracking system, while the Typhoon has the world-leading PIRATE. The F22 currently has limited networking capability: its Link 16 datalink currently works only in Receiving mode, and will need update, while the Typhoon has a fully functioning Link 16, which was demonstrated in a third-part targeting training which saw an E3D Sentry designate a target for a Typhoon flying with its radar turned off. The successful engagement proved that the Typhoon, with support from an AWACS, could fly with its radar turned off, thus emitting no tell-tale signals at all, while searching targets with its PIRATE sensor passively, and launch against targets designated externally by the AWACS. Again, the F22 has a very advanced AESA radar against the currently mechanically-scanned array used by the Typhoon. However, for all the advantages of the AESA radar in terms of range and reliability, it also has the drawback of a search azimuth of just 120°, against the 200° degrees coverage offered by the Typhoon’s Captor radar. It is worth remembering that the F22 was planned to have two side-mounted AESA radar arrays (cut to save money) to remedy to the small field of view, in fact! As to the Low Observability, the Typhoon does not fare badly in this field either: it has been optimized, however, for low observability only frontally, differently from the all-around stealth F22. However, we should always remember that the Typhoon is equipped with the most effective and advanced self-protection suite in the world, including everything up to towed radar decoys. Even in terms of performances, in the end, the Typhoon is much better than we often give it credit for. And I honestly wish people would remember it a bit more, instead of shooting on it gratuitously, calling it a disgrace. Fighter jets are expensive, but they are also extremely effective and flexible, and the Typhoon definitely is the best platform the RAF could get. Despite the problems, the delays, and the budget setbacks. Besides, much as it is European, it is mostly british. A beautiful product of british thought and engineering, that deserves a lot more respect. The Sea Typhoon was first touted in 1996, and was the only STOBAR aircraft type to be considered by the JCA studies to determine what airplane would fly from (and thus effectively shape) the CVF ships. Initial pre-feasibility studies were undertaken in early 1996 by British Aerospace's (now BAE Systems) Military Aircraft and Aerostructures Department to consider a Eurofighter Typhoon (N) (possible service name - Sea Typhoon). These looked promising and in 1997 a further 27 month contract was let to study in more detail both catapult-launched (CTOL) and STOBAR variants, these would have in common a strengthened undercarriage and an arrestor hook, and possibly a larger thicker wing with power folding and more powerful vectored thrust EJ200 engines. Both variants would have required a large conventional carrier design equipped with an angled flight deck and arrested wires for landing. The Sea Typhoon lost appeal in 1999/2001, when the Joint Strike Fighter started to grow in strength, propelled by (unrealistic) promises of amazingly low and affordable prices. Problems that were also pointed out where the very low ground-clearance between deck and big loads on some of the Typhoon’s pylons during rough deck landings, and a Delta-Canard design was considered not optimal for carrier landings because of how its shape restricted the pilot’s visibility. In 2001, the JSF became the UK’s choice for the Joint Combat Aircraft requirement. However, the Typhoon (N) is not dead, and in 2005 it had a new moment of glory, when the UK was faced by the menace of not getting access to the software, source codes and other important details of the Joint Strike Fighter. The Sea Typhoon was thus officially announced as the “Plan B” in case of failure of the JSF and/or continued denial from the US of the access to the core of the F35’s core technology. The greatest moment, the true maturity of the Sea Typhoon, however, has come with its official presentation, last 9 to 13 February 2011, at the Bangalore defence show in India. The new, main target of the Sea Typhoon is, in fact, India: the Indian navy is preparing for the entry in service of the INS Vikramaditya in 2014 (the ex URSS Admiral Gorshokov) and of its new, home-built carrier that will follow it in the water. India has already ordered a number of MIG-29K for its naval aviation, but it has also issued a new Request of Information to the major industries for the acquisition of a further batch of naval fighters. The MIG-29K is again a contender, the F/A-18 will be evaluated, the Rafale and Sea Gripen have been proposed, and Eurofighter has been quick in ensuring it can be part of the match as well by presenting its Sea Typhoon. Offering a naval variant is seen as vital not so much because of the order in itself, which will be significant but not massive, but because this new requirement is likely to influence the larger MRCA procurement as well, and here Eurofighter holds massive interest, since this is truly the “deal of the century” in terms of fighter jet export orders. 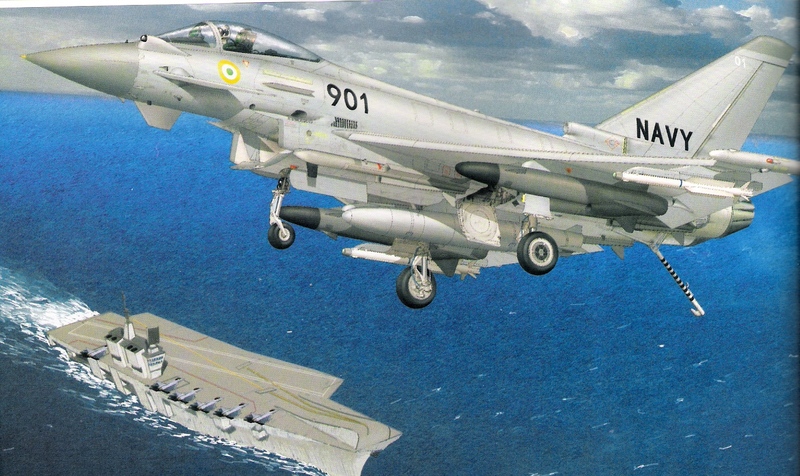 Eurofighter concept art of a Sea Typhoon of the indian navy, armed with two RBS-15 Penguin anti-ship missiles. The Sea Typhoon as presented is a STOBAR aircraft, which needs arresting wires but does not require a catapult, being capable to take off comfortably with just a sky jump. It thus matches the capability offered by the MIG-29K in this sense, and represents an “easy and cheap” solution. Eurofighter is not worried by entering the sea domain, because the Typhoon, already as it is, is made at the 85% of composites, much less affected by corrosion from salty water. The studies have confirmed that a Sea Typhoon would require partial strengthening of some areas of the airframe (the wing’s root, the air intake of the engines and some bulkheads) for just about 340 kg of increase in weight. The undercarriage needs to be strengthened and the shock absorber needs a longer available run to handle rough landings, and a new, strengthened arresting hook is also obviously necessary. The very reduced amount of strengthening needed on the airframe (already built to very demanding standards) is a particular good news because it means low costs, little redesign and very high commonality with the normal “land” Typhoons, estimated at values as high as 95%. 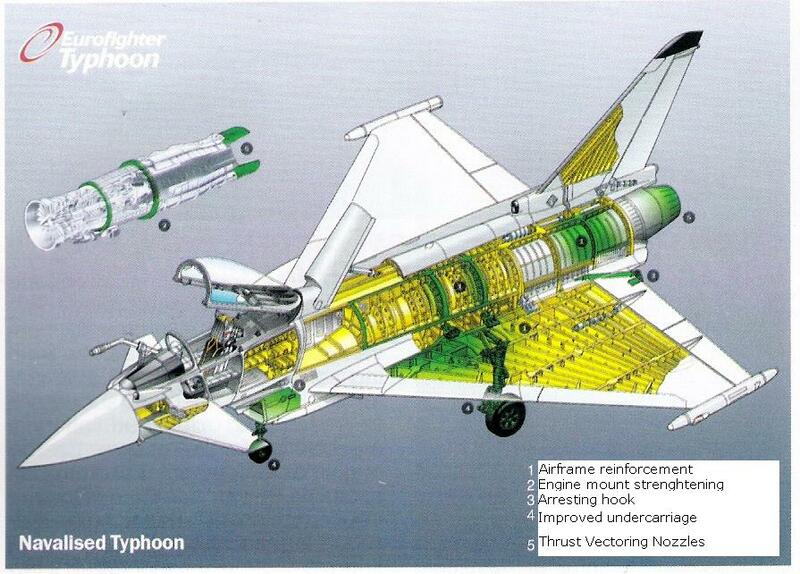 A 2001 MOD source put the cost of Sea Typhoon at "25% more than a normal Typhoon". This is now seen as a pessimist estimate, but it gives us an idea of a possible unit cost. Assuming the 67 million pounds figure for Typhoon, Seaphoon might cost as much as 84 millions. The adoption of Thrust Vectoring Nozzle is required to improve handling, particularly in the delicate landing phase, but also to help the fighter to take off. Simulations made by Eurofighter, however, showed that the Typhoon would have no problems taking off from a sky jump with a full 23 tons weight, with conformal fuel tanks, 6 BVRAAMS, 2 SRAAMS and heavy weaponry of the Storm Shadow class. (the images shown by Eurofighter in India showed anti-ship missiles RBS-15 Penguin, actually, but just because an anti-ship missile is required by the Indian Navy, while they are not interested in Storm Shadow, at least for now) The Thrust Vectoring Nozzles would add a further 70 kg of weight, but this would merely compensate the weight saved by adopting an AESA radar in place of the current Mechanical one. The Sea Typhoon is a very seductive option, and it is a pity, now, look back at 2001 and think that, with some more courage, this road could have been taken instead of the JSF path, which is experiencing, comparatively, cost-overruns much worse than those that have affected the Typhoon! A cost figure recently provided by US sources puts the F35C at 145 million dollars apiece, which, at current exchange rate, would mean 90/91 million pounds. An F35B is reported to cost 161 million dollars. Reading the reports from Bangalore about the Sea Typhoon, I’ve admittedly started questioning the rationale of the F35C choice. We still are in time for a change, I’ve though. There are risks, I also am aware of it. Words are always easy, and listing the changes needed to the airframe is a comfortable exercise. Could something go wrong during the redesign, causing cost-overruns…? It is more than possible. However, we are faced, on the other side, by an F35 that will cost… surely more than one hundred million dollars apiece, and we don’t know yet how much more. The MOD now expects to pay the JCA 70 million pounds apiece, which is a quite a lot, and might well prove not enough according to latest cost estimates coming from other sources. Besides, the engines are not part of the F35 declared cost: the UK MOD is paying its 3 test F35B 119 million dollars each (LM figure), and to that is to be added the engines and other cost voices (possibly inclusive of 13 million dollars for studies on Shipborne Rolling Vertical Landing techniques) for a reported total cost of 389 million pounds. The three F35B test planes ordered so far are effectively costing nearly 130 million pounds each. iA single PW F135 engine costs 15 million dollars. In the STOVL configuration of the F35B, it is reported to cost no less than 32 millions. We have to question if it is worth it, and where we really are heading. - It has a single engine, with the survivability limits this implies. How does the Sea Typhoon compare? Range, in fact, is only a part of the Endurance factor. With just two AA missiles and two bombs, a F35 in stealth configuration can intervene only once, twice at the most, and then, even if it has fuel for more loitering time, it has to get back to embark new weapons. The Typhoon carries a lot more ordnance of all kinds. And lastly, the Sea Typhoon would offer commonality with the RAF Typhoons. Same engines, same radars, many spare parts absolutely compatible, and other logistical advantages. The Sea Typhoon, in the end, might result a lot less expensive than the F35C. And it will not need catapults, either, which are another important voice of expenditure as we all know. I think the main question is: how much is it possible to save by buying Sea Typhoon instead of F35C…? Because if for the same money needed for 40 F35C the UK can buy the last tranche of 68 Typhoons, but in Sea configuration, to equip 3 squadrons of the FAA, I think I’m all the way to the end for the second option. It is nearly a STOL aircraft, since it takes Off in 500 meters and lands in 600 meters, which is part of why a STOBAR conversion, with the few necessary modifications, is feasible. In terms of Interceptor performances, a Typhoon can scramble, taking off from the runway and reaching Mach 1.6 at 10.980 meters of altitude within the maximum time of 150 seconds. Its acceleration performance is world-beating, and a Typhoon flying at 370 km/h at low altitude can speed up to Mach 1 in just 30 seconds. With the cruise mode at Maximum Fuel Efficiency (one engine at Minimum regime and one at Maximum, without afterburners) it maintains a speed of 995 km per hour (Mach 0,9) while with standard load of 6 air to air missiles (4 BVRAAM and 2 ASRAAM) and both engines in “Military” regime (max thrust without afterburners) it can fly in supercruise at over Mach 1. Only the F22 can do it better, keeping an official supercruise speed of Mach 1.5. From the words of Paul Metz (chief of the pilots who trialed the F22 Raptor): “supercruise is vital for the whole concept of Stealth Fighter. The lone Low Observability does not make you invisible, but only really small. Speed makes things even more complex for the enemy, who’s left with less time to detect you, lock you and fire on you and make sure that his missile effectively reaches you. High supercruise speed sustainable for long periods are a clear advantage in the struggle to avoid enemy weapons”. The Typhoon could in future get an higher supercruise speed thanks to the fitting of Thrust Vectoring Nozzle (which comports a significant growth in power output, along its other advantages), but for now it combines a good (even if not unbeaten) supercruise capability with world-class acceleration capability. 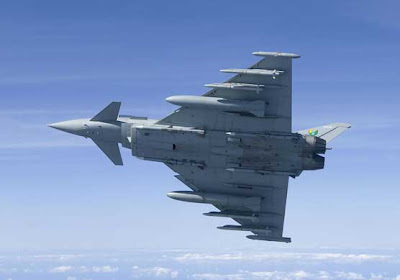 The enormous kinetic energy of a Typhoon reaching high speed also helps giving air to air missiles a boost, allowing them to work in their top-end range of performances. Typhoon’s flight envelope ranges from a max speed at minimum altitude of 1389 km per hour (750 knots) at sea level to Mach 2 (2124 km per hour) at 11.000 meters of altitude. It can fly to 16.750 meters of altitude and maneuver from – 3G to + 9G, with 5,5 G maximum sustained value in “Heavy” ground attack configuration (example, standard load of air-to-air missiles plus 2 Storm Shadows, 1 centerline 1000 liters fuel tank and, possibly, 2 Paveway IV bombs (ALARM missile had also been planned) or two more BVRAAM (AMRAAM and, in future, Meteor). The Typhoon incorporates extensive measures for the reduction of its IR and Radar trace, but it is considered Low Observable only from the front side. Effective Radar Cross Section is obviously classified, but the RAF Staff Target 414 (the baseline requirement set that was adopted for the definition of Typhoon’s requirements at European level) required a frontal RCS of maximum 0,05 square meters equivalent. Reports have never been detailed, but always unanimously confirmed that this has been more than met. Thanks to the IRST Pirate and its capability to target its missiles basing itself on third-part designation (AWACS or even another Typhoon), the Eurofighter can often keep its radar turned off, and it results particularly hard to detect in terms of electromagnetic emissions. Air Superiority - 6 AMRAAM, 6 ASRAAM (4 on two twin pylons in addition to the normal mounts) and up to three fuel tanks. Other RAF configuration seen is 4 AMRAAM and 4 ASRAAM. Air to Ground attack – One Litening III targeting pod, 4 AMRAAM, 2 ASRAAM, up to 6 Paveway II bombs or 4 bombs and two fuel tanks. The Typhoon so far can employ bombs of the Paveway II, III and Enhanced Paveway classes, in the variants GBU-10 (934 to 956 kg class), GBU-16 (454 kg class) or GBU-24 (900 - 1000 kg class). These weapons have been integrated by the RAF with a national programme as a measure of urgency, to deal with the delays that the other countries in the Eurofighter consortium were causing because of their own budget problems. Between 2011 and 2012, the Typhoon fleet is to experience the Phase 1 Enhancement, which will bring up to date the software and the air-to-ground capabilities. Improvements will also be made on the DASS, GPS navigation, MIDS data link and other parts of the plane. The Typhoons receive the upgrades during their scheduled mainteinance periods to reduce impact on the frontline service. A RAF Typhoon exercising Ground Attack capability at Nellis AB, in the US. Note range instrumentations fitted in place of the ASRAAM missile underwing, the Litening III pod centerline and the inert (blue warhead) training Paveway II bombs. For the end of 2014 is foreseen the Phase 2 Enhancement, the plan for which has been presented by Eurofighter on 30 may 2008. This upgrade will include the usual “obsolescence removal” but will, moreover, finally involve the integration on the fleet of Storm Shadow, KEPD-350 Taurus, Small Diameter Bombs, Brimstone, Meteor and Paveway IV. The RAF has been trying in all ways to anticipate this programme to have the Typhoon upgraded earlier, and budget permitting the PR11 is expected to included measures taken in this sense, in particular to remedy, at least in part, to the closure of two Tornado Squadrons and the retirement of the Harrier GR9, with the consequent drop in Air to Ground capability. Notably, the Paveway IV has been recently (early march 2011) test-launched from development IPA6 Typhoon, flown by test pilot Nat Makepeace at the Aberporth range in the UK. It was a successful test flight demonstrating the avionics system is able to use GPS data and target information sourced from the aircraft to prepare for the release. All communication with the aircraft and the safe release of the bomb all went to plan. The test was part of BAE's ongoing programme to integrate Paveway IV with the aircraft. Environmental and jettison trials have already been completed, and the weapon will be available for trials by the Royal Air Force fleet in 2012. German IPA development plane showing some of the very impressive load capacity of the Typhoon carrying four 900 kg Paveway bombs on top of standard AA missile fit and 3000 liters of external fuel. Real Heavy Load! 1000 liters of external fuel, 2 Paveway bombs, 2 Storm Shadow, 2 ALARM, 4 AMRAAM and 2 ASRAAM. A flying arsenal. This is a good example of the Typhoon's possibilities. Follows a small collection of known, notable Eurofighter successes in simulated combat and multinational exercises. The 'clash' took place last year over Windermere when the two-seater RAF Eurofighter was 'bounced' from behind by the two F-15E fighters. The US pilots intended to pursue the supposedly hapless 'Limey' for several miles and lock their radars on to it for long enough so that if it had been a real dogfight the British jet would have been shot down. But much to the Americans' surprise, the Eurofighter shook them off, outmanoeuvred them and moved into shooting positions on their tails. 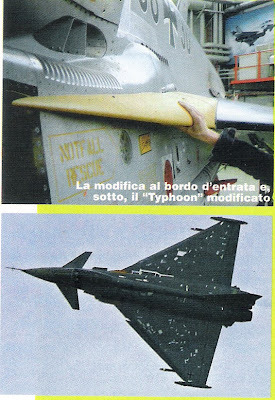 Less known is that the Typhoon reportedly took on the F22 as well, as reported in "international AIR POWER REVIEW" - year 2006, issue 20, page 45. “more recently, there have been repeated reports that two RAF Typhoons deployed to the USA for OEU trails work have been flying against the F-22 at NAS China Lake, and have peformed better than was expected. There was little suprise that Typhoon, with its world-class agility and high off-boresight missile capability was able to dominate "Within Visual Range" flight, but the aircraft did cause a suprise by getting a radar lock on the F22 at a suprisingly long range. The F-22s cried off, claiming that they were "unstealthed" anyway, although the next day´s scheduled two vs. two BWR engagement was canceled, and the USAF decided they didn´t want to play anymore . - When this incident was reported on a website frequented by front-line RAF aircrew a senior RAF officer urged an end to the conversation on security grounds"
Note: unstealthed might refer to the practice that USAF officially claims to use to somewhat degrade the stealthness of their F22s during training exercises. This practice resembles the reported fitting of a radar reflective kit to the Sweden Visby stealth corvette during her travel across the Channel to ensure safety by making the vessel more visible on the radars. I’ve no evidence of what these measures effectively comport, nor is there any confirmation based on more solid facts that I can quote. Don’t take this as an unassailable truth. For what we know, the USAF might very well fit absolutely nothing to its F22s in exercises! Official sources, well documented, inspired this other news that I take from an Italian magazine of defence aviation, “Aeronautica e Difesa”, of January 2009. During a DACT (Dissimilar Aircraft Combat Training) exercise of NATO over the Spanish base of Gando, on the island of Grand Canaria, the 111° Esc. Ejèrcito del Aire with Typhoon fought against the 493° Squadron USAF, equipped with F15 fighters. In the simulated dogfight, 2 Typhoons were pitched against 8 F15s. The first Typhoon, flown by Mayor Juan Balesta, shot down 4 F15s, while the second Typhoon took out 3 more. The last F15 escaped. The Typhoon performed awesomely at the Singapore competition to find a replacement for the local F16 fighters and upgraded A4 Super Skyhawk, even if it was dropped in favor of the F15 (almost certainly because the uncertainty about the ground attack capabilities of the Typhoon, which were, back then, admittedly worrisome). Typhoon was up against the American F15E and the French Rafale. Typhoon won all three combat tests, including one in which a single Typhoon defeated three RSAF F16s, and reliably completed all planned flight tests. According to one observer, neither competitor aircraft could claim the same (Defence Analysis August 2004). The 1 vs 3 with the F16s test was completed ONLY by Eurofighter. Both Rafale and F15E failed. "AFM understands, however, that the evaluation, which was the first time Typhoon had flown outside Europe (redeploying together with a VC10 air tanker), was a resounding success. Though BAE and Eurofighter will not confirm any details, it is believed that the two aircraft (they were RAF T1 fighters) flew 28 missions, totalling 35 flying hours, during the course of which the aircraft convincingly demonstrated its air-to-air capabilities, first against a pair of F-16s and then against a package of six F-5S and F-16C/D aircraft. It also demonstrated its ability to 'supercruise' (fly supersonically without reheat), achieving Mach 1.21 on a normal, hot Singapore day. This impressed the Singaporeans - and Typhoon's rival bidders, whose aircraft require reheat for supersonic flight. "They didn't wait for the cool evening, they didn't wait for a cooler day - they just went out and did it in a hot, daytime, tropical environment," one Rafale programme insider told AFM, with grudging admiration. "The Singaporeans were astonished and asked why they hadn't advertised that they could do it. The answer was that these RAF jets weren't weighed down with a tonne of flight test instrumentation, so they could do it while the Development Aircraft are probably a little slower!" The US Air Force Mag wrote in october 2001 that Typhoon easily overcomes the Su-35/37 performances and those of the F-15, and it is considered second only to the F22 in terms of capabilities. The Typhoon is faster and has better radar search performances than the F15, and is also harder to detect, even if it is not considered Stealth. A few years ago, the RAF conducted an accurate study over the Typhoon’s capabilities, simulating a range of scenarios to determine the likely outcome of a similar situation in real fighting conditions. These studies contain data that’s remained mostly classified, but some results, “cleaned” of the classified bits, have been allowed to get out, and have also been used by the Eurofighter consortium to promote their jet on the market. In particular, an interesting simulation saw a scenario with 4 Typhoons in two separate CAPs flying at Mach 0,72 and 30.000 feet of altitude, with AEW support from a E3D Sentry. 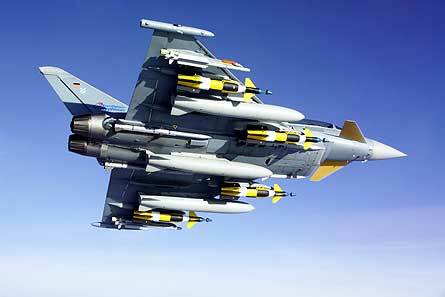 Each Typhoon was simulated with load of 3 fuel tanks (100%), 4 AMRAAM and 2 ASRAAM. The enemy force saw a first formation of 4 Su35 Flanker at 36.000 feet and Mach 1,2 paving the way for a formation of 3 more Flankers as escorts and 8 Mig 29 in strike configuration with two AA-11 short range air to air missiles and 2000 kg of bombs each, flying at 500 feet and Mach 0,73. The Flankers were simulated with a load of 6 AA-12 and 2 AA-11 missiles each. The 4 Typhoons lost a fighter but took down 5 Flankers, damaged one more and downed two of the MIGs. Note that in NATO simulations the Su-35 is given high survivability chances because of how well spaced out its two engines are (until a few years ago the norm was that to down a Flanker two AMRAAMs were needed). The same simulation, carried out with F15E, saw two Eagles downed, in exchange for 4 Flankers plus one damaged and a single MIG. The Kill/Death ratio of the Typhoon was > 7:1, and > 10:1 with a following simulation in which each Typhoon was fitted with 6 AMRAAMs instead of 4. The F15E had a ratio > 2:1. Roughly similar was the result with the Rafale, while much worse was the performance of F16C, F/A-18E and Gripen. These two factors determine the agility of a fighter jet and are particularly relevant during the missile launch and immediately after, in the re-attack phase: greater thrust and agility allow to get back into the fight with greater kinetic energy and speed, influencing favorably also the performances of the missiles themselves, which benefit of an increase in speed and range. 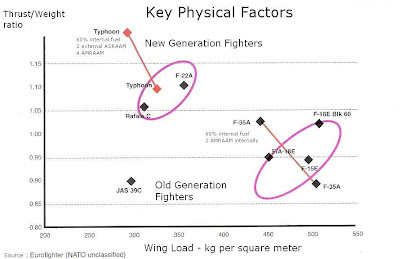 The Typhoon is, also in this case, close to the F22 in the key performance factors, with the Rafale following closely, but with the limitations deriving largely from the underpowered SNECMA engines (the same ones that the UAE did not want, and the same that France wanted to power the Eurofighter as “reward” for participating in the joint programme, from which it soon pulled out when the answer from the rest of the group was a firm no). The Jas 39C has a very low wing-load, worth of the best fighters, but it is limited by a very low thrust/weight ratio. 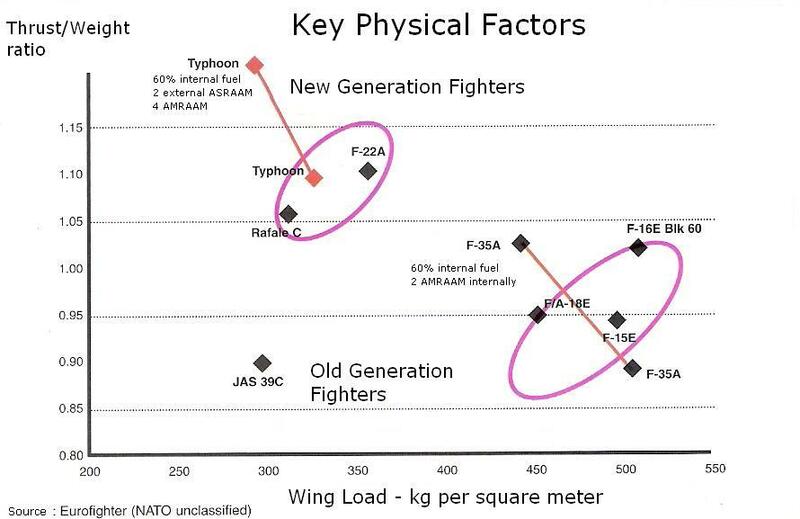 The F35 also shows very clearly in this graphic that, despite all its technology, in terms of physical performance it has nothing at all of extraordinary, to say the very least. AESA Radar – the CAPTOR-E, also known as CAESAR, indispensable to aim to future export orders, starting from India’s ongoing competition, is already being developed. The RAF has been one of the most active supporters of the need for a timely upgrade of the Typhoon’s radar, and the UK started funding a development programme before the other nations of the consortium. Successively, the development programme of the UK and of Eurofighter have been fused into a single joint effort, based on the RAF idea. The CAPTOR-E will be an Active Electronic Scansion Array that will build on the success of the CAESAR aerial (Captor Active Electronic Scansion Array Radar) that flew on the IPA-5 test plane Typhoon already in 2005 and 2007, and that will have the unique feature of the Wide Field of Regard (WFoR) repositioner, giving the new radar a 200° azimuth coverage unmatched by any currently available AESA radar. 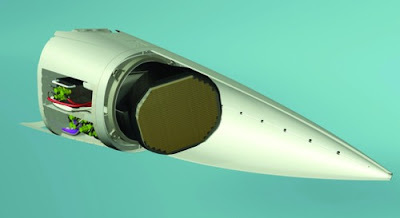 Current AESA radar are fixed-position, flat-panel aerials: at the larger, more acute electronically scanned angles, these radars have a low transmission power, with degraded performances and range. This is a drawback in Beyond-Visual-Range fighting, since the tactic of a BVR engagement is essentially acquire the target, launch the missiles and then turn away as fast as possible to escape from the enemy’s answer. However, even modern “Fire and Forget” missiles such as AMRAAM and Meteor need the pilot to keep the missile and target in its radar Field of Regard for a finite amount of time, to provide guidance to the missile until it is truly fully autonomous. The radar inside the missile’s seeker, after all, has a finite range, and in long-range engagement it needs position-upgrades on the target’s position and status. This will be even more true with the Meteor and its greater range and dual-way datalink allowing even for in-flight re-targeting. The new AESA radar for the Typhoon will be mounted on a mechanical repositioner that will allow the radar plate to turn to the side and keep the target locked even in fields of view of +/- 100° and more. In terms of fightability, this promises to allow the Typhoon to break away from an incoming enemy missile attack twice as fast as a fixed-plate AESA equipped fighter jet, while still guiding its missiles on target. A capability definitely worth having, especially to make the most gain from the new Meteor missile. Experimental AESA radars for the Typhoon have been several, including CAESAR and AMSAR. Now, after the RAF took the initiative on its own and contracted SELEX Galileo to develop an high-performing AESA radar for the Typhoon, the whole consortium is following on the path. The RAF study and requirements are likely to build on the results of the Advanced Radar Targeting System (ARTS) demonstrator project, which saw an advanced AESA radar fitted and test-flown on a Tornado GR4. While the ARTS upgrade to the Tornado GR4 has now been killed, its results are moving on onto the Typhoon effort. Contrary to current, fixed-plate AESA radars used in F15s, Sukhoi and even F22 fighters, the new Typhoon radar will sit on a "repositioner" which will electrically turn the radar aerial to the sides to cover a much wider range of view and allow the Typhoon to break away from an engagement while still keeping the enemy tracked. - Improved reliability, with less need for mainteinance and “Graceful Degradation” of the radar, which continues to be effective even if some of the thousands of Transmitter/Receiver modules of the aerial have a failure, while a mechanically scanned radar can simply cease to work if there’s a failure of the single transmitting element or in the single main power source. This makes for a great increase in “Mean Time Between Failure” for the radar system and improves the aircraft’s availability as a whole. - Improved target detection, greater range and greater number of operations that can be accomplished at once by the system. The new AESA radar, coupled with the Meteor missile, will be a true game changer for Air to Air combat: the Typhoon will be able to see its enemy earlier, fire the missile at a much greater distance, and break away from enemy reaction much sooner and faster, improving enormously the chances of survival and success in BVR engagements. Wider lateral field of view is also an advantage in a dogfight. To give an idea of the relevance of this factor, it is worth remembering that the F22 Raptor project originally included side-mounted AESA arrays that, however, were between the first victims of cuts, along with the Infra Red Search and Tracking system (that the Typhoon instead has). In terms of budget, the conversion to the AESA radar promises to be an excellent investment, ensuring a much lower need for mainteinance, while the conversion from CAPTOR-M to CAPTOR-E will be made “simple” by the fact that the back-end processing computers of the radar will be largely the same, being them still very up to date, if not world beating. The modifications to the back end software and computer system will be kept to a minimum. The development builds on a 30 million dollars RAF contract to Selex Galileo, which should bring to the first flight of a Typhoon fitted with the new radar in 2013, with ISD expected in 2015, with the possibility of retrofitting the new system to all the Typhoons in planned mainteinance periods. 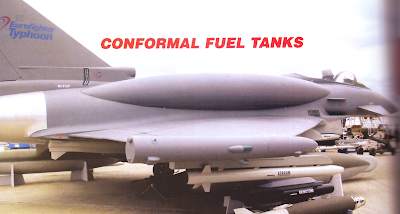 Conformal Fuel Tanks – already shown in more than one image and air show, the Conformal Fuel Tanks have the interest of the RAF in particular regarding to future air to ground attack missions. The Typhoon originally had to have 1000 and 1500 liters external fuel tanks to choose from, but the 1500 liters tank, to be derived from the large “Hindemburger” fuel tanks of the Tornado, was soon enough abandoned. Early Wind-Gallery CFT test. The Conformal Fuel Tanks hold the same amount of fuel of three external fuel tanks, and do so leaving pylons free to carry weapons. They have less drag penalty than jettisonable fuel tanks and have a better Radar Cross Section, improving the stealth of the plane. The RAF is reportedly very interested. The USAF installed (and never removed) conformal fuel tanks on the F15 to create the F15E, and they have been very happy of it. Currently, the Typhoon can fly with up to three 1000 liters supersonic external fuel tanks: one at the middle station under the fuselage and two under the main inner-pylons under the wings. However, the RAF has integrated the Laser Designation pod Litening III in the central store point, while the two inner pylons are the ones that, in an attack mission, would carry the Storm Shadow cruise missile. It is obvious that there are situations in which the mission’s needs would inevitably end up being in conflict. The conformal fuel tanks, already commonly used on aircrafts such as the F15E and on the F16 in various versions, are dorsal-mounted supersonic “bulges” that, in the case of the Typhoon, contain 1500 liters of fuel each. Leaving all store pylons free, and delivering significantly less aerodynamic degradation of performances. Considering that range is never enough, and that the Typhoon has been seeing its air-to-ground role increasing more and more in the years as it became clear that Tornado would not have been replaced by a dedicated platform and that the JCA F35 will be in small numbers, it would not be surprising to see the Conformal Fuel Tanks become, in time, a permanent fit, like in the case of the F15E Strike Eagle, which wears its own all the time. CFTs have been actively marketed at air shows. According to a 2009 article of AviationWeek the RAF Tranche 3 aircraft also are being prepared to use conformal fuel tanks from as soon as they enter service. They could also be fitted, later on, to earlier Typhoons. Thrust Vectoring Nozzles – these have long been seen as not necessary on an aircraft as agile as the Typhoon, and in terms of dogfight performances we can assume this is quite true. Mostly because dogfights are rare and not the most likely of scenarios for the immediate future, in all honesty, and not because additional agility wouldn’t be precious. In any case, the EJ200 engine is built with upgrades in mind: it has up to an amazing 40% thrust growth margin, and it is pretty much built “fitted for, but not with” Thrust Vectoring Nozzles, that the Eurofighter and Eurojet consortium have been actively developing and testing, primarily for export, but also for future upgrades of the fleet. There are essentially three types of vectoring nozzle; ones in which the entire post-turbine section is moved, those which feature external nozzle attachments for directing thrust (e.g. the X-31 paddles) or ones in which thrust is vectored within the divergent section. The ITP system uses the later design requiring no external equipment (which adds weight and offers relatively poor efficiency) and reducing distortion on the major engine structures (a problem with using the first method). The new Thrust Vectoring Nozzle, TVN is a convergent/divergent type containing three concentric rings linked via four pins forming a unified Cardan joint. Each of these rings serves a purpose, the inner ring is connected to the nozzle throat area with the secondary ring forming a cross-joint connection with the pivoting outer ring. This outer ring is in turn connected to the divergent section (green on the CAD diagram) via several struts or reaction bars (black on the CAD diagram to the left). The outer ring is controlled by either three or four hydraulically powered actuators situated at the North, South, East, West, South West and South East positions. By minimising the number of required actuators (either three or four) ITP claim there is little additional weight, reduced actuator power demands and increased reliability over previous systems. Additionally the nozzle utilises a partial balance-beam effect to minimise the actuator load requirement. This effect uses the exhaust gases themselves to close the nozzle throat area, according to ITP this gives a 15% reduction in actuator loads in certain circumstances. TVN nozzle graphic. Eurofighter says that a complete set of TVNs for a Typhoon jet adds only 70 kg to the weight of the plane. Roughly the same weight that would be saved by swapping current CAPTOR radar for the new AESA radar CAPTOR-E. The baseline vectoring configuration uses three actuators (North, South East and South West). By moving each actuator either in or out the outer ring (red) can be tilted in any direction (see CAD diagram to right, top picture) thus offering both pitch and yaw control. Any net directional movement in the outer ring is then translated via the struts into a larger movement of the divergent section, vectoring the thrust. As well as vectoring control (via movement of each actuator) it is possible to alter the throat area directly by moving all three actuators outward or inward in parallel. In both cases the outer pivot and the inner (green) throat area ring are fixed in the axial direction which reduces the required number of actuators. Beyond the baseline case the TVN includes a pro-baseline configuration offering the ability to alter the divergent section exit area as well as vectoring thrust and altering the throat area. To achieve this the outer ring is split into top and bottom halves and four actuators (in the N, E, S and W positions) are utilised (see CAD diagram to right, bottom picture). By moving each actuator in a unified/combined manner the thrust can be vectored and the throat area altered. However by moving just the N and S actuators the split ring hinge can be opened and closed. In turn this moves the upper and lower strut series either in or out opening or closing the exit area. In a traditional Con-Di nozzle the exit area is directly related to the throat area. The problem with this approach is that it is extremely difficult to optimise the nozzle shape to different flight profiles, e.g. subsonic cruise, supersonic dash. By allowing dynamic control of the exit area the nozzle shape can be altered on the fly. According to ITP this allows for significant improvements in achievable thrust in all flight profiles. TVN-equipped EJ200 engines have been extensively tested for a good few years already, proving the maturity of the concept. The three ring system is not the only unique feature of the nozzle. In previous convergent/divergent systems the reaction bars or struts have been connected to the divergent section at a single point. This limits their deflection range thus imposing limits on achievable thrust vectoring (typically to no more than 20°). The ITP TVN however uses a dual point hinged connection allowing a far greater range of movement to be achieved (according to ITP, studies indicate 30°+ can be achieved). By careful placement of the struts, problems with the nozzle petals overlapping or colliding are also removed. Since rig trials commenced in 1998 the TVC equipped EJ200-01A has run for 80 hours (February 2000) of which 15 hours were at full reheat (including sustained five minute burns) during 85 runs. These trials have included over 6700 vectoring movements at the most severe throttle setting and 600 throttling cycles under the most demanding vectoring conditions. These trials demonstrated full, 360° deflection angles of 23.5° with a slew rate (the rate at which the nozzle can be directed) of 110°/s and a side force generation of some 20kN (equal to approximately to one third of the total EJ200 baseline output). These vectoring trials have included both programmed ramp movements and active joystick control. The studies have also verified the MTU developed DECU (Digital Engine Control Unit) software and FCS connections. - With afterburner, the major efficiency of the TVN keeps the temperature in the engine from 10 to 20° K lower than without it. It has not yet been calculated specifically the exact impact of this lower temperature on the expected life of an EJ200, but it is evident that lower temperature means less stress, and longer life without faults. - The TVN allows for a lower take-off speed, with considerable advantages in terms of airframe life and allowing for the use of runways up to 20% shorter. It also allows for a reduction of the landing distance: it is not a case that the “Sea Typhoon”, offered to India in the air show this month after being announced as far back as 1999, mounts TVN nozzles. - The availability of thrust-vectoring control allows for a fall-back option to maneuver the aircraft even if the canard and control surfaces fail, either for mechanical failure or because of battle damage. - TVN reduces the need for usage of the wing-mounted control surfaces of up to -15%, contributing to increasing the airframe expected life. Eurofighter is well aware that these are the factors that really will matter in an eventual order from the four original partner nations. While countries such as India would want the TVN for increasing the performances of the fighter, the RAF is attracted by them because of the reduced life-cycle costs that they would make possible. I believe that, if the ongoing tests will confirm such good results, the Thrust Vectoring upgrade should be taken into very careful evaluation. Just the reduced consume of fuel could, in itself, justify the upgrade in the long term with the savings it would make possible. An interesting other possible update is about LERX: the Leading edge root extensions has been trialed on the german DA5 prototype Typhoon in 2007. After a year worth of studies, in fact, the DA5 was fitted with two tiny experimental LERX surfaces and flew for the first time on October 1, 2007, from the german airbase of Manching. The DA5 fitted with the small LERX surfaces. The improvements in the already formidable agility of the Typhoon has been surprising: the LERX delays the loss of lateral stability during maneuvers at high angle of attack, and the tests showed that, in a standard AA weapons configuration with 4 BVRAAM missiles and two SRAAM, the DA5 with LERX gains a good 10% more turning rate than normal Typhoons. It is unclear if this modification can be financed and fitted at least to the Tranche 3A Typhoons. The RAF has received all of its 53 Tranche 1 Typhoons. The early Typhoons were Tranche 1 Block 1, with basic air-defence only capability. The first planes handed to the RAF were twin-seats necessary for training, and in the RAF they are known as T1. The first Typhoon T1 is one of the Instrumented Production Aircraft (IPA1) and remains part of the BAE fleet. The aircraft's maiden flight was on April 15 2002. The official in service date for the first RAF Typhoon T1, serial ZJ803, was June 30 2003. Formal delivery occurred on December 18 at which point 17 Sqn began a full flying programme as the type's Operational Evaluation Unit. T1A is the denomination for the twin-seat Tranche 1 Block 2 airframes, instead. Normally there wouldn't be an ad-hoc designation, but the Block 2 incorporates significant improvements, which include a modification of the fuel plant. Typhoon F2 is the denomination of the single-seat fighter variant. The first F2 is IPA5 and also remains with BAE, its first flight was June 6 2002. Typhoon T3 is the designation of the twin-seat Typhoons of the Tranche 1 Block 5 variant, either new-built or updated airframes. Typhoon FRG4 is the designation for the new built or updated single-seat fighters. All F2 Typhoons are to be upgraded to FRG4 standard with the R2 programme. Similarly, all twin-seats are being upgraded to T3. The new mark number represents the increased capabilities of the Block 5 aircraft (fighter/ground attack/reconnaissance). The FGR4 has from June 2008 achieved the required standard for multi-role operations. FRG4 apparently is being used as designation for the Tranche 2 fighters being received now, too. The RAF has a total of 160 Typhoons on order with 70 Typhoons in operational squadrons. One Typhoon Tranche 1 has been written off after a crash landing in China Lake during a training exercise. The Identity of the two squadrons to be reformed is not entirely sure. Rumors are that they will be 43 and 111. In particular, the 43 Squadron was announced almost officially and reported on the press already soon after 43 squadron disbanded and its Tornado F3 were retired in July 2009. Four of the six planes of 17 Squadron are reported to be T3 from the Tranche 1, and two FRG4 also are part of the formation. All F2, T1 and T1A are progressively being updated into FRG4 and T3. On January 16th 2006 the crew of ZJ810/BI had to perform an emergency landing at RAF Coningsby after the aircraft's nose landing gear failed to deploy. The pilot held the aircraft's nose up until aerodynamically braking and the brake chute slowed it down sufficiently to allow the nose to make contact with the runway. The images of the Coningsby nose-landing are quite famous. The plane was repaired. The second incident is more serious: on April 23rd 2008 Typhoon FGR.4 ZJ943 made a wheels-up landing at China Lake in the US, following a mission described by the RAF as "routine trials work dropping laser-guided bombs". The pilot was unhurt but the aircraft was declared as Cat 4/5. This Typhoon has been written off according to sources, and it has probably since been cannibalized of all useable parts. It is to be considered the first RAF Typhoon loss. This brings down the number of RAF Typhoons Tranche 1 to 52, and the total figure to 159. ZJ944, ZJ945, ZJ949, ZJ950 and ZK301 departed for the Falkland Islands on September 12th 2009. The deployment involved a total of ten support aircraft from four squadrons flying 280 hours supported by 95 personnel in addition to the fighters and their aircrews. In a two-stage operation the aircraft were trailed by tankers to Ascension Island, using the Canary Islands as a staging post. From Ascension, they were trailed again to the Falkland Islands without any outside assistance. The Typhoons were accompanied by a TriStar aircraft throughout, whereas the other air-to-air assets provided fuel at various stages before returning to Ascension; in all, each Typhoon was required to refuel seven times. The Falkland Islands-based VC10 was on hand to provide a final top-up of fuel if required and to enable the Typhoons to divert to the South American mainland had the weather deteriorated unexpectedly during the nine-and-a-half hour transit. In addition, Hercules and Nimrod aircraft provided Search and Rescue cover for the long sea transits, and were equipped with survival equipment and spare life rafts that could be dropped to any survivors in the water in the event of an incident that necessitated an ejection. Four VC.10 aircraft from 101 Squadron, which flew some 87 hours and involved 28 personnel. Three C.1/C.3 Hercules aircraft from 70 Squadron, which flew 90 hours and involved 21 personnel. One Nimrod MR.2 from 120 Squadron, RAF Kinloss, which flew 14 hours and involved 20 personnel. The Typhoons arrived at Mount Pleasant on September 16th 2009. ZJ945 subsequently returned to Coningsby, leaving ZJ944, ZJ949, ZJ950 and ZK301 down south: the four planes have now taken the traditional identities of Faith, Hope, Charity and Desperation. Faith, Hope and Charity are active fighters, and Desperation is an on-site spare/reserve airframe. The first three names date back to the famous three Gloster Gladiators that defended Malta in the early hours of the II world war. 1435° was in fact the unit defending Malta back then, and during the war it became the only four-numbers squadron formation in the history of the RAF. In early June 2010 two Typhoons and the VC-10 air tanker based on the Falklands had to divert to Punta Arenas in Chile after poor weather closed Mount Pleasant. This required the aircraft to fly over Tierra del Fuego; authorization for this was given by the Argentinian Air Force. No doubt there was nervousness when the request had to be sent out, with how Argentina behaves about the islands and the planes going in and out of them! 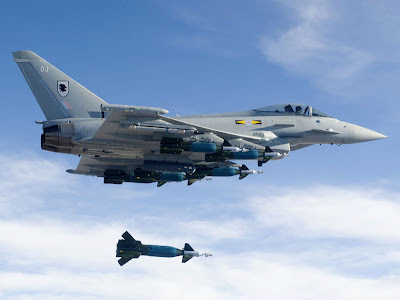 On 18 March 2011, British Prime Minister David Cameron announced that the UK would deploy Typhoons, alongside Panavia Tornados, to enforce a no-fly zone in Libya. On 20 March 10 Typhoons from RAF Coningsby and RAF Leuchars arrived at the Gioia del Colle airbase in southern Italy. On 21 March RAF Typhoons flew their first ever combat mission while patrolling the no-fly Zone. On 29 March, it was revealed that the RAF was short of pilots to fly the required number of sorties over Libya and were having to divert personnel from Typhoon training in order to meet the shortfall. A number of instructors now fly operative missions, and this is slowing down the formation of other pilots. On 12 April 2011 a mixed pair of RAF Typhoon and Tornado GR4 dropped precision-guided bombs on ground vehicles operated by Gaddafi forces that were parked in an abandoned tank park. Chief of the Air Staff, Air Chief Marshal Sir Stephen Dalton, revealed during the Royal Aeronautical Society's Aerospace 2011 conference in London, that each aircraft dropped one GBU-16 Paveway II 454 kg (1,000 lb) laser guided bomb which struck "very successfully and very accurately". The event represented "a significant milestone in the delivery of multi-role Typhoon." Target designation was provided by the Tornados with their Litening III targeting pods due to the lack of Typhoon pilots trained in air-to-ground missions. UK's Defence Secretary Liam Fox admitted on April 14 2011 that at least 5 pilots had been grounded because there were not enough fully-working Typhoon jets to give everyone the necessary share of flying hours. The RAF is currently "cannibalizing" aircraft for spare parts in a bid to keep the maximum number of Typhoons operational on any given day due to shortage of spare parts. Up to 13 airframes were subject to cannibalization. The report noted that the shortages had also affected pilots' training last year, with only eight of the Royal Air Force's 48 Typhoon pilots qualified for ground attack operations - the role the plane is currently being used for in Libya. The Ministry of Defence had warned the problems were likely to continue until 2015, when the supply of spare parts should become steady and effective. A RAF Typhoon forward-deployed to Gioia del Colle airbase, Italy, has, during operation Ellamy over Libya, conducted the first succesful strike mission of the Eurofighter. 2 battle tanks were destroyed with a Paveway II laser-guided bomb.